Some say Kashmir is a paradise on earth, others say it is a paradise by itself, but indeed Kashmir outstands all the stunning places on earth. Srinagar, the summer capital of the state is in full bloom throughout the season and even in winter, this city has its own charm. The snow-clad peaks of Himalayas are lined with hyacinths, irises and amaranth flowers. There is beauty in every corner of Srinagar and it is mesmerizing to take a stroll in the old streets of the city. I almost covered the three-fourth of Srinagar on foot on different occasions during my stay in the city. In this article, I have included some of my favourite places to see, do and eat in Srinagar. This is a no brainer. 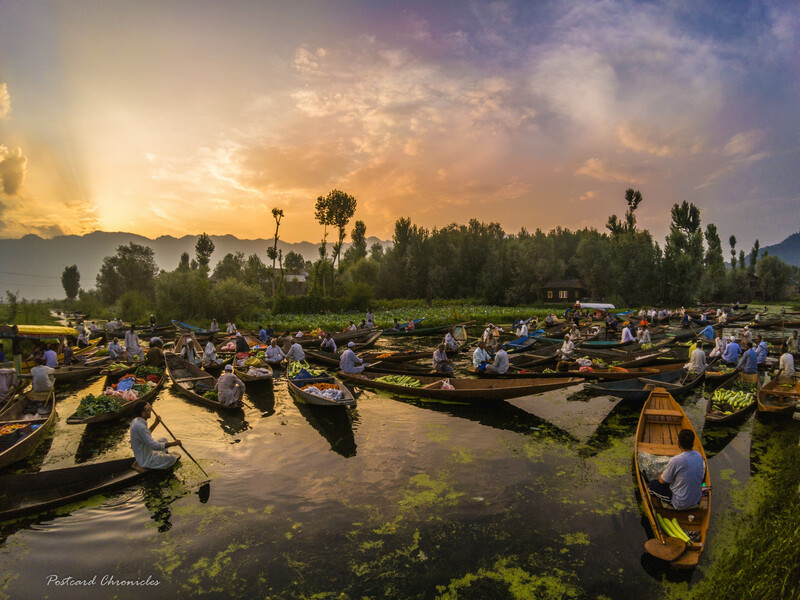 A sunset shikara ride on Dal lake is a soul soothing experience. The summers are long in Kashmir and the sun sets only around 7pm in the evening. The beauty of taking a sunset ride is that you start the ride when the sky is blue, then slowly the sky turns into various hues of orange, pink and purple turning your shikara ride a mesmerizing experience. This dainty white structure dates back to as far as the early seventeenth century. It is situated on the western banks of the picturesque Dal Lake. Facing the beautiful Nishat Bagh, the mosque offers a spectacular view of the lake and the mountain afar. Drop by on a weekday morning and you’ll be surprised at how peaceful it is! Also Girls – make sure you carry something to cover your head and shoulders and wear something that covers your elbows and knees as well. This charming monument is literally known as the abode of the fairies in local parlance. It’s easy to see why! The multi-tiered monument and its grounds boast of a spectacular view of the valley. You can see the entire city of Srinagar, its lakes, 4 golf courses and surrounding meadows from this vantage point. The Floating Vegetable Market of Srinagar, is a place where Kashmiris living within the lake buy their daily fruit and vegetable supplies. Of course, the lake is famous already for it’s houseboats, but the floating market is essential for life to function within the lake. Srinagar’s floating vegetable market is one of the few such market in the world, and other ones are in Thailand and Vietnam. The market comes to life at 5am so be prepared to wake up at 4am and take the ride. Srinagar is home to Asia’s largest Tulip Garden. The flowers are in full bloom only for a short time during the months of March and April, so time your visit accordingly. They make for some spectacular views. But there is no shortage of scenic botanical gardens at other times of the year either – add Shalimar Bagh, Nishat Garden, or Chashme Shahi Garden into your itinerary and you won’t be disappointed! A visit to Srinagar would be incomplete without exploring the atmospheric and distinctly wooden Old City on foot. Be it Khanqah-e-Moula shrine or Jama Masjid, the streets of the old city oozes culture and heritage. The market lanes are filled with spices, dry fruits and handloom stores. As always, this was my most favourite part – you can see so much life walking around! Most people on the streets are very friendly and smile at you and your camera. Bakeries in Srinagar open early and one can enjoy local breads for breakfast. It is a treat to walk down the road and enjoy a rustic breakfast, amidst the sights and sounds of Srinagar, at wayside bakeries in Lal Chowk and Dalgate. Tsot – A small round bread topped with poppy and sesame seeds, which is crisp and flaky. Noon chai – Salt tea or Pink tea.Best to wash down the breads with.This pink tea gets its colour from the bicarbonate of soda. A roadside tea stall is the best bet for noon chai. A stroll around Dal Lake will reveal a selection of Kashmiri nibbles and snacks. Lotus stems, potatoes and peas deep fried in gram flour are on offer. Kahwa – I should say I was addicted to this drink while in Srinagar. This flavourful concoction is made with green tea, saffron, and spices and serves with a generous sprinkling of sliced almonds. It has dozens of health benefits and is said to be excellent for digestion and building immunity. Despite endless cups, it keeps you wanting more. A leisurely dinner with rice and rotis usually forms a typical home meal. Non-vegetarian dishes are relished at dinner. Rotis are usually crisp, as the dough is kneaded with milk. Wazwan – No mention of Kashmiri food would be complete without Wazwan. Traditionally, it refers to an elaborate feast, featuring choicest delicacies, prepared specially for weddings and special occasions. But you will spot Wazwan tasting platters on most restaurant menus. This is the perfect way to sample a series of local delicacies, ending with the indulgent gustaba, meatballs in a creamy yogurt-based sauce. Tabak maaz: Kashmiri-style lamb ribs, marinated with local spices and milk, and fried. This indulgent delicacy is extremely popular with locals. Gushtaba– large meatballs served in yoghurt –This dish is usually the grand finale in the main course. Phirni: If you have a sweet tooth, do not leave the area without trying a bowl (or two) of phirni. This indulgent dessert is made from ground rice, cream, milk, sugar, cardamon, and a variety of nuts including almonds and pistachios. It is delicately flavoured with rose essence which lends it an inimitable flavour. I went to Ahdoos twice during my stay in Srinagar. The food is finger licking good, simply delicious and we were stunned looking at the quantity. The Kashmiri Pulao had meat and kebabs of all types and the Nadru Yakhni (mildly spiced lotus stem cooked in a yoghurt based curry) was a revelation. This is the best place to try Wazwan. The platter served is authentic Kashmiri cuisine and the portions are overwhelming. You need a big group to finish the platter. The hotel room is spacious, clean and you get hot water to take a good shower. Dinner and breakfast is a lavish buffet while the food is delicious as well. The cost is also not high on the pocket and is quite budget friendly. If you’re looking for a budget friendly hotel, then this is you’re go to place. Floating Heaven Houseboat, this was one of the best stays during my Kashmir trip. The interiors of the houseboat are so well done that you fall in love with the place immediately. It silently sits on Nigeen lake facing the bridge on side and lotus garden on the other. The hosts were warm and hospitable and took care of me very well. I would definitely suggest to stay here as the cost is also not too high.